BitDefender 9 Internet Security covers all the security needs of an Internet-connected family. It provides essential protection against viruses, spyware, spam, scams, phishing attempts, intruders and objectionable web content. Antivirus The mission of the Antivirus module is to ensure detection and removal of all viruses in the wild. 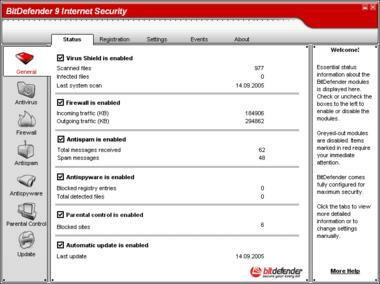 BitDefender Antivirus uses robust scan engines, certified by ICSA Labs, Virus Bulletin, Checkmark, CheckVir and T�V. Firewall The firewall module filters network traffic and controls the access time and permissions for applications and users connecting to the Internet. In Stealth Mode your computer is " hidden" from malicious software and hackers. Antispam, Quite simply put, the BitDefender antispam module deals with the problem of spam, so you don&apos; t have to. Antispyware, Monitor and prevent potential spyware threats in real-time, before they can damage your system. By making use off a comprehensive database of spyware signatures, your computer will remain spyware-free. 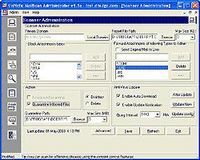 Parental Control, The BitDefender parental control module can block access to web sites you deem inappropriate, block access to the Internet for certain periods of time (such as when it&apos; s time for lessons), and block applications like games, chat, filesharing programs or others from running.